First and foremost, RVs are fun to fly. Their controls are light, responsive, and beautifully harmonized. We’ll just say it: Chances are that you have never flown an airplane that offers anything approaching the exhilarating sensation and flying confidence of an RV. The tandem RV-4 and RV-8/8A are soloed from the front seat, but elevator and aileron controls for the rear seat are also available. The RV-7/7A, RV-9/9A and RV-10 feature full dual controls, except passenger brakes, which are optional. The RV-12iS and RV-14/14A models include dual brakes standard. Baggage space in the RV-4 consists of about 7 cubic feet in a compartment behind the hinged seat back. Weight allowed is about 35 pounds, depending on optional equipment and other loading factors. The RV-4 has an optional front baggage area, accessible from within the cockpit, that can carry up to 15 pounds. The wide forward fuselage of the RV-8/8A provides not only more instrument panel space, cabin width and foot room than the RV-4, but also allows a forward baggage compartment between the instrument panel and the firewall. It holds about 4.75 cubic feet, and is accessible through an outside door. The traditional baggage compartment behind the rear seat remains. By having two places for baggage, one forward and one aft, the pilot has more loading options and is better able to control the CG. The RV-7/7A, RV-9/9A, RV-12 and RV-14/14A each carry baggage behind the seats in a large bay. Depending on various factors (mostly the engine and propeller up front) RVs can carry between 65 and 100 pounds of baggage and two adults – even more for the RV-14. The RV-10 has a generous baggage compartment aft of the rear seats, reached through a baggage door on the left side. The rear seats can also be removed in a minute or two, providing a truly huge space. All RV wings are relatively low aspect ratio, constant chord designs with no taper or twist. This planform offers light weight, easy construction, and favorable stall characteristics. The wide chord maximizes the permissible CG range. It also provides generous wing area and low wing loading even in a wing of short span. Because of this low wing loading, climb and altitude performance are unusually good for an airplane of such short span. Two-seat RVs (the RV-9/9A excepted) use the proven NACA 230 series airfoil. These are turbulent flow airfoils with very low pitching moments. They do not require perfectly smooth surfaces to achieve good performance, so they remain almost unaffected by bugs and rain. The low pitching moment allows cruise trim drag to be kept to a minimum. The RV-9/9A uses a new Roncz airfoil design with a slightly longer wing span, shorter chord and slotted flaps for better low speed performance. The RV-10 uses a similar wing, but with a slightly different airfoil. The most important part of the airplane is the people inside it. Their safety is paramount. Since forward visibility and safety are close relatives, upright rather than supine seating was chosen. We felt that it would be illogical to lay the passengers down and then have them try to see forward over the engine. Operational safety and crash survivability, often overlooked in homebuilts, are primary concerns to everyone at Van’s. First, to limit the possibility of accidents, RVs have excellent controlability, gentle stall characteristics and superb visibility. In the event of an unavoidable crash landing, (engine failure over rough terrain, for instance) their low landing speed has been a real lifesaver. A crash at 50 mph is 70% more survivable than one at 65 mph. This, along with the rugged cockpit structure and sturdy roll bar should permit you to walk away from, or at least survive, almost any controlled emergency landing. Comfort is also important. Too many airplanes contort their occupants to suit the airframe shape. We choose to provide generous legroom, shoulder room and head room first and design the airplane around those features. RV cockpits are quite roomy and accommodate pilots and passengers up to 6’ 4’’ tall — and even taller in the RV-8/8A. Minor modifications are possible to allow even taller people to fit. Easy maintenance was another prime consideration. Controls, linkages and fittings are easy to install and service. Removing everything necessary for a complete annual inspection (cowl, inspection covers, fairings, etc.) takes less than an hour. The straightforward, simple airframe, control system and landing gear have only a few points that require service. 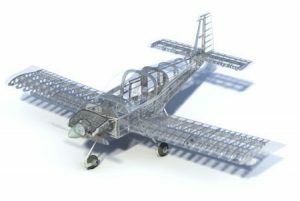 Given proper storage and maintenance, the airframe is essentially a “life-time” structure. RVs are designed and built so they can be dismantled when necessary. All of the tail surfaces are removable. 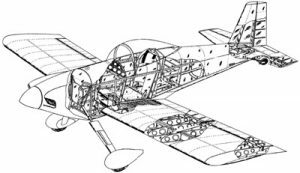 Wings are constructed in two separate panels and simply bolt to the fuselage. The landing gear attaches with just a few bolts. This permits easy transport to the airport for initial assembly, or later disassembly for major maintenance. Disassembly does require disconnecting the control, electric and fuel systems, so RVs should not be thought of as “take-home” or “trailerable” airplanes – with the notable exception of the RV-12, which has easily-removable wings build specifically to allow the owner to trailer the airplane on the road and store it in a small space if desired. In the early days, Van coined the term “Total Performance” to describe his design goals: highly-capable on both ends of the performance spectrum as well as in-between. In more than forty years, we haven’t come up with a better description. While the RVs are excellent cross-country airplanes, they are not simply “go-fast” machines. They have outstanding low speed characteristics and short-field capabilities; a rare combination. Most are capable of delightful sport aerobatics. Balancing all the competing and conflicting requirements involved in a “Total Performance” airplane is a complex and difficult task – just think of how few airplanes have really done it well.